A curious harbor seal checks out diver Mike Weber as he and other divers pick up golf balls in the waters off the coast of Northern California. His daughter wrote a paper about all the golf balls found in the ocean from nearby golf courses. A diver in California has stumbled on an unexpected source of plastic waste in the ocean: golf balls. As the balls degrade, they can emit toxic chemicals. And there appear to be lots of them in certain places underwater — right next to coastal golf courses. Two years ago, a 16-year old diver named Alex Weber was swimming off Pebble Beach along the Pacific near Carmel, Calif. "My dad raised me underwater," says Weber, and she means it. She's a free diver: no scuba tanks; she just holds her breath. She was diving in a small cove and looked down and saw something weird. "You couldn't see the sand," she recalls, still sounding incredulous. "It was completely white." White with golf balls. "You looked down and you're like, 'What are you doing here?' "
There were thousands of them. "It felt like a shot to the heart," she says. She was offended. Right then, she decided to haul them up. Thus began a Sisyphean task that went on for months: She and her father would haul hundreds of pounds of them up, and then of course more golfers would hit more into the ocean. She took what she and her father collected back home. "I had all of these golf balls in the garage," she says. "And they stank." Then she heard about a Stanford University scientist, Matt Savoca, who studied plastic waste in the ocean. She emailed him, and he came to look at her collection. "Fifty thousand golf balls, just sitting in the garage," she says. Savoca was impressed. Weber recalls that he turned to her and said, " 'You should write a paper about this,' and I was like, 'Matt, I'm 16 years old. I don't know how to write a scientific paper!' "
He said he would help, which meant diving with her. Not easy. "The oceans off California are actually quite cold, so you suit up in a pretty thick wetsuit," he says. "It's incredibly physically demanding." They took kayaks out to ferry the golf balls back. "Once you recover many, many golf balls, you put them on the kayak," he explains. Adds Weber: "We'll have the kayaks so filled with plastic that we'll end up just having to tow the kayaks — we'll have to swim (them) to shore." There are sharks in the water there, but Savoca says that wasn't the real threat. "When we were out there," he says, "We'd hear, 'plink, plink,' and we'd look up on the hill and there'd be golf balls flying in off the course right into the ocean where we were doing collections." Despite the aerial barrage, they kept at it, says Weber. "Whenever we had good conditions, we were able to pull out between, like, 500 to 5,000 golf balls," she says. Over two years, they found more than 50,000 golf balls. The source: five golf courses. Two along the coastline, and three up the Carmel River — those golf balls rolled underwater down the river to the ocean. In the journal Marine Pollution Bulletin, the team notes that golf balls are coated with a thin polyurethane shell that degrades over time. They also contain zinc compounds that are toxic. Savoca points out that the surf and currents act like a rock grinder and break down the golf balls. While chemicals from 50,000 or so golf balls will have only a small effect on the ocean, Savoca says they do degrade into microplastic pieces that marine animals could eat. The team also notes that there are lots of coastal golf courses around the world, so this may go beyond California. Alex Weber, now 18 and a published author in a scientific journal, plans to apply to university to study marine science. In the meantime, she is still collecting, and keeping up her website. She says it is too bad the golf balls sink. If they floated, people would be shocked and outraged. "If a person could see what we see underwater," she says, "it would not be acceptable." Divers in California have stumbled on an unexpected source of plastic waste in the ocean - golf balls that come from coastal golf courses. Golf balls contain plastic and can emit toxic chemicals. And as NPR's Christopher Joyce reports, there are lots of them underwater, something discovered by a 16-year-old diver named Alex Weber. ALEX WEBER: My dad - he raised me underwater. CHRISTOPHER JOYCE, BYLINE: Alex Weber is a free diver. She just holds her breath. In 2016 near Carmel, Calif., she and her father were diving in the Pacific just offshore from a golf course. She looks down and saw something weird. WEBER: You couldn't see the sand. It was completely white. WEBER: You look down, and you're like, what are you doing here? JOYCE: Thousands of golf balls. WEBER: It felt like a shot to the heart. JOYCE: She was offended. She decided she'd haul them up. She put them in her family's garage. WEBER: I had all of these golf balls in my garage, and they stunk. And I had no idea why. JOYCE: Then she heard about a scientist who studied plastic waste in the ocean. His name was Matt Savoca from Stanford University. She emailed him. He came to look at her collection. WEBER: Fifty thousand golf balls just sitting in the garage. He said I should write a paper about this. And I was like, Matt, I'm 16 years old. I don't know how to write a scientific paper. JOYCE: He said he'd help. That meant diving with her - not easy. MATT SAVOCA: The oceans off California are actually quite cold, and so you suit up in a pretty thick wet suit. It's incredibly physically demanding. JOYCE: They took kayaks out to ferry the golf balls back. WEBER: We'll have the kayaks so filled with plastic that we'll end up just having to tow the kayaks back, and we'll have to swim it to shore. SAVOCA: While we were out there, we would hear plink, plink, and then we'd look up on the hill, and there would be golf balls flying in off the course right into the ocean where we were doing some collections actually. WEBER: Whenever we have good conditions, we're able to pull out between about, like, 500 to 5,000 golf balls. JOYCE: Over two years, they found more than 50,000 golf balls. The source - five golf courses. Three were up the Carmel River. The golf balls just rolled under water down to the ocean. 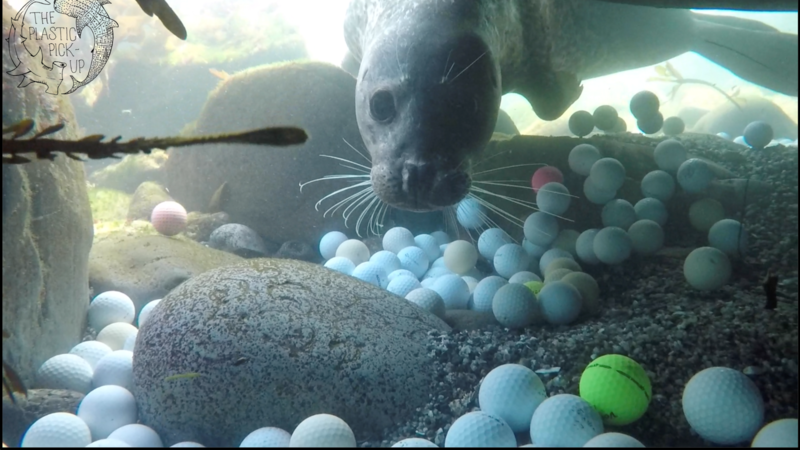 In the journal Marine Pollution Bulletin, the team says chemicals from 50,000 or so golf balls will probably only have a small effect on the ocean, but they do degrade into microplastic pieces that marine animals could eat. Alex Weber says if those golf balls floated, people would be shocked. WEBER: If a person could see what we see underwater, it would not be acceptable.